Saturday, June 15, 2019: Historic Walking Tour of College Hills area of Mānoa. 8:30 a.m. to 12 p.m., starting at Kamanele Park. Please click HERE to register via Eventbrite ($40 plus fees). Sunday August 26, 2018 2nd Annual Manoa Urban Garden Tour…tour 3 inspiring gardens! For more information and registration click here for Eventbrite. Wednesday February 28th Malama Manoa is honored to host a FREE SCREENING of Thomas Bena’s film, One Big Home. 5:45pm Manoa Public Library, 2716 Woodlawn Drive. Bena will introduce the film at 5:45, and the screening will begin at 6pm. Get your FREE ticket at eventbrite. April/May 2017 Greening Measures for Hawaii’s Historic Homes Workshop Series Click here to view the flyer for details. Sunday November 12th Mālama Mānoa Celebrates 25 Years of Service to Our Valley. 4-6pm Manoa Public Library, 2716 Woodlawn Drive. General Membership Meeting and Opening Reception of Ku’u Mānoa A Photo Contest Celebrating Mānoa. April 8, 2017 Manoa Adopt-a-stream 10:00am – 12:00 (noon). Meet at Woodlawn Drive Bridge. November 22, 2016 Annual General Membership Meeting 6:00 -7:30 pm at the Manoa Valley Theatre. Click here to view the flyer. June 11th, 2016 (Sat.) 2016 Historic Walking Tour 8:30 a.m. to 12:00 (noon) check-in and the walk start is at Kamanele Park (at University Ave and Ka‘ala St). Join us for the Historic Walking Tour of the College Hills area of Mānoa. The tour will include at least eight historic home interior visits along a 2-mile route of more than 60 homes built in the 1920s and 30s. For full details click HERE. April 24th, 2016 (Sun.) 1000 Tree Giveaway 8 a.m. to 12:00 (noon) at Manoa Valley District Park. In this Year of the Monkey, we’ll feature monkeypod trees; other trees will include kukui, mountain apple, coconut, kamani nut, plumeria, sea grape, hau, papaya, avocado and many more. April 11th, 2016 (Fri.) “HOW TO DECLUTTER YOUR LIFE” 9 a.m. to 11:00 am Manoa Valley Church Multipurpose Room upstairs 2728 Huapala Street Across from Manoa Marketplace behind Starbucks. Presentation includes informational materials. For more information, visit www.manoavalleychurch.org or call 988-3271. November 14th, 2015 (Sat.) MANOA STREAM CLEANUP 10 a.m. to 12:00 (noon) Volunteers Welcome! Meet at the Woodlawn Drive Bridge across from Manoa Longs by 10:00 am. Wear covered toe shoes. Come help celebrate MAKE A DIFFERENCE MONTH by keeping our Manoa Steam clean! September 19th, 2015 (Sat.) 2015 Luncheon Honoring The Kūpuna of Mānoa Valley 11:00 a.m. to 1:00 p.m For full details please see the invitation here. August 9th, 2015 (Sun.) The Outdoor Circle Yard Sale 8:00 a.m. to 1:00 p.m at 2230 Kamehameha Avenue in Manoa The Manoa branch of The Outdoor Circle will be hosting their 2nd Fundraiser Yard Sale. April, 2015 (Sat.) Earth Month 2015 Manoa Public Library. For full details and events please see the flyer here. April 7, 2015 (Sat.) 6:30 PM to 8:30 PM: Manoa Public Library. Amazing ‘Ulu. Tree giveaway. Breadfruit foodshare. Samples. For full details please see the flyer here. January 6, 2014 (Tues.) 6:30 PM: Manoa Elementary School. Manoa Community Meeting. This is one of the meetings conducted by Rep. Isaac Choy, and might be an opportunity to hear more about Paradise Park’s future plans. There will probably be one of Mr. Wong’s representatives present at the meeting. It would be worthwhile to attend to voice comments and/or ask questions about Paradise Park’s plans as interested Manoa Community members. December 3, 2014 (Wed.) 6:00 PM: Annual General Membership Meeting:“Historic Homes in Honolulu”. Dr. William Chapman, Director of the UH Historic Preservation Program, will discuss the Historic Preservation Program and its activities and the Hawai’i Register of Historic Places, including some of the Manoa homes and others on the list, their architectural styles and significance. He will also present information on procedures for and benefits of listing a historic home on the Register. The event will be at College Hill, the traditional UH President’s home at 2234 Kamehameha Avenue, near Oahu Avenue. The public is invited, no reservations necessary. November 7, 2014 (Sat.) 5:30 PM to 7:30 PM: in the New Gym. Manoa District Park FALL FAIR. FUN, FUN, FUN!!! Bring your kids or grand kids to enjoy lots of Games & Prizes! Malama Manoa will be volunteering at one of the game booths. November 1, 2014 (Sat.) 9:00 AM to 1:00 PM: 44th Annual Manoa Valley Church Harvest Fair. The public is invited to attend this event: free admission for the whole family. Pro-ceeds will be used for Church facility maintenance and renovations.. For full details please see the flyer here. November 1, 2014 (Sat.) 10:00 AM to 12:00 PM: Make A Difference Day. Meet at the bridge along Woodlawn Drive near Longs Drugs. Let’s clean up debris along Manoa Stream. For full details please see the flyer here. September 13th, 2014 (Sat.) 9:00 AM – 2:00 PM: “Be Ready Manoa” Fair. Manoa Valley District Park Gym. Theme: disaster preparedness by residents. For full details please see the flyer here. July 19, 2014 (Sat.) 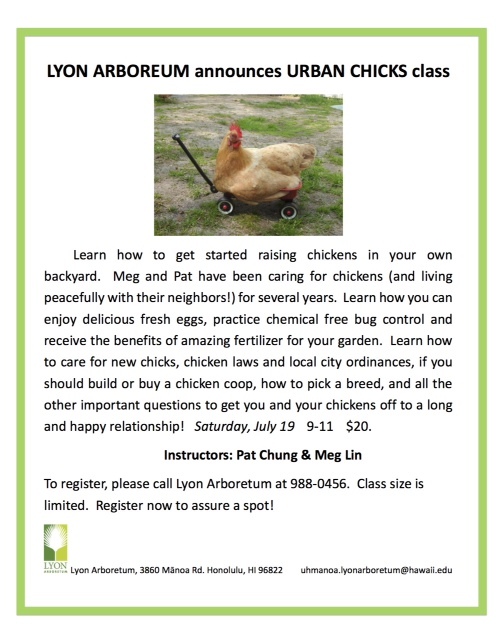 9:00 AM – 11:00 AM: Urban Chicks Class. Lyon Arboreum. For full details please see the flyer here. July 5, 2014 (Sat.) 9:30 AM -noon: Manoa Public Library Garden Workday. Manoa Public Library. For full details please see the flyer here. May 31, 2014 (Sat.) 8:30 AM – 9:30 AM: Manoa Neighborhood Ride. Manoa Public Library. For full details please see the flyer here. June 21, 2014 (Sat.) 6:30-8:30 pm: Korean Natural Farming in your Backyard (Malama Manoa Urban Farming Series). Manoa Public Library. For full details please see the flyer here. April 19, 2014 (Sat.) 10 AM to noon: Urban farming with Malama Manoa. Manoa Public Library. For full details please see the flyer here. April 5, 2014 (Sat.) 10 AM to noon: Stream cleaning. Assemble at the Woodlawn Drive bridge mauka of Noelani Elementary school. Closed shoes required. gloves and bags provided. Takes less than 2 hours. Contact George Arizumi (gtarizumi@gmail.com, 988-5069) or Jim Harwood (harwood.jim@hawaiiantel.net, 941-0435) for information. March 26, 2014 (Wed.) 6 to 8 PM: General Membership Meeting- Public invited! Manoa Public Library, Community Room. Presentation by Karen Ah Mai, Executive Director of the Ala Wai Watershed Association - “Melting Manoa”, a slideshow about Manoa Valley erosion. December 21, 2013 (Sat. ), 5 PM - Manoa Christmas Parade. Noelani School to Manoa District Park. November 21, 2013 (Thurs.) Disaster preparedness Workshop. 10 AM – 2 PM – Manoa District Park meeting room. Information here. November 20, 2013 (Wed.) Woodlawn Drive Bridge “Drop Structure Project” informational meeting, 6 PM, by invitation only. (5:30 PM at the bridge for on-site project review.) MM board members invited, along with others. For information, Jim Harwood at 941-0435 or harwood.jim@hawaiiantel.net . November 16, 2013 (Sat.) Stream cleaning. 10 AM-12N. Assemble at the Woodlawn Ave. bridge mauka of Noelani Elementary school. Closed shoes required. gloves and bags provided. Takes less than 2 hours. Contact George Arizumi (gtarizumi@gmail.com, 988-5069) or Jim Harwood (harwood.jim@hawaiiantel.net, 941-0435) for information. November 1, 2013 (Fri.) Manoa District Park Fall Fair: Our district park is putting on its annual Fall Fair at the “new” Gymnasium from 5:30 – 7:30 PM. Free. Fun for kids as well as grownups. Games and activities. A Manoa classic! Plenty of parking in the lot off Manoa Road. October 25, 2013 (Fri.) Melting Manoa: League of Women Voters luncheon (optional) and talk about Manoa Valley erosion at Paradise Park, Treetops Restaurant, from 10:30 AM to noon. October 1, 2013 (Tues.) General Membership Meeting- Public invited! See- Manoa Valley Theatre Cemetery activities for details. The site is at 2833 East Manoa Rd. Here are pictures of the event. 27 July 2013 (Sat.) Stream cleaning. 10 AM-12. Assemble at the Woodlawn Ave. bridge mauka of Noelani Elementary school. Closed shoes required. gloves and bags provided. Takes less than 2 hours. Contact George Arizumi at gtarizumi@gmail.com or 988-5069 for information. 6 July 2013 (Sat.) General Membership Meeting- Public invited! 10 April 2013 7:00 PM General Membership Meeting- Public invited! Manoa Gardens (Senior community meeting room). Park at the nearby District Park stalls at the mauka/stream corner of the parking lot. Walk up the short path to the complex. Do not drive into the complex; car stays in district park lot. Featuring history of na wahi pana o Manoa – sacred, celebrated or legendary places of Manoa as read by various Manoa characters. 20 April 2013 10:00 AM Stream Cleaning. Assemble at the Woodlawn Ave. bridge mauka of Noelani Elementary School. Closed shoes required. Gloves and bags provided. Takes less than 2 hours. Contact Jim Harwood at harwood.jim@hawaiiantel.net or 941-0435 for information. Malama Manoa will demonstrate tumbler and worm composting. Exhibit of popular chicken breeds for backyard flocks. Also, plant your own kalo, ti and ko. Here is the flyer for the event.